I did the four day and three night camping Inca Trail. The views were fantastic, especially once the true Inca trail started from ‘Dead Woman’s Pass’. Highlights were Machupicchu, which you can't fully appreciate until you arrive on the last day and view the great size and beauty of it. Everything about the trip was great! The food was really good every day and there was always enough to go round everyone.. The actual Inca Trail itself was amazing, I really enjoyed every day of it. We had a terrific Salkantay trip with our guide David, cooks, Ballentine, and Roy, and horseman Miguel. David introduced us to the beautiful Andes, told the history of our trail and its people, and shared his knowledge of Machu Picchu with our small group. Salkantay Trek- 20th August- 24th August 2011. The Salkantay Trek was definitely an adventure that I will never forget. 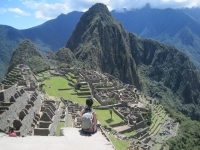 I could not think of a more beautiful way to experience the trip to Machu Picchu. The Salkantay Trek was great. It was challenging, but a lot of fun. It was definitely an experience that I will never forget. I enjoyed the trip a lot. The food was really great, but I think that there was too much of it. I think that on the second day it is possible to go further after a break at the bottom of the descent.